Comparisons with Steely Dan are thrown about on a regular basis but Mount Pressmore have a greater claim than most since not only do the Austin, Texas act favour complex, jazz-flavoured arrangements but they have a frontman who is blessed with a similar, precise and rasping delivery to Donald Fagen. That man is Thomas Shaw, son of 14-time Grammy award winning conductor Robert Shaw. His band, all of whom have musical degrees to their name, certainly have the credentials but do they have the songs? The worry is that sometimes the songs are too complex, as if the band are all too willing to show off their technical proficiency; straddling that line between clever and the “clever clever”. ‘Interchange’ is an example of the latter; it’s jerky, staccato style too awkward to love. To balance this, the lyrical matter is concerned with somewhat prosaic matter which at least ensures the songs remain grounded even if the ambitions are lofty. ‘Vice-Presidential Material’, for instance, views the subject matter from the perspective of three different people in a political triangle but the propulsive rhythm section and Shaw’s yearning vocals steer the track away from indulgence. ‘The New Regional Branch Manager’ begins with the line “all day long I’m shuffling paper in my brain” and continues with its tale of everyday ennui and paranoia. Crucially, it’s also one of the catchiest songs with some ingenious electric piano hooks. ‘Dry Land’ pulls out another fine sequence of keyboard-driven melody and contains the most infectious of choruses. The band are careful to maintain an emotional distance for much of time but they do strike an chord on ‘A Place In The Sun’ where the words “On comes the tide of age. Day giving way to night .To an infinite night” reveals an unexpected gift for poignant poetry. 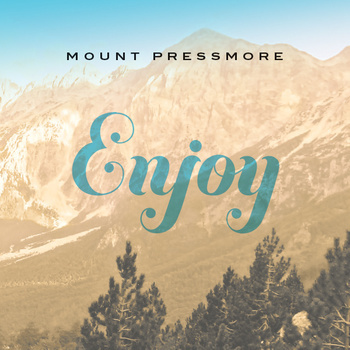 Despite a slight tail-off in hooks towards the end of the record, Mount Pressmore are a far more accessible proposition than they might originally appear. Their songs may be carefully constructed but they give indie jazz rock a very good name. Shaw senior will certainly be proud of his son and bandmates but so would Messrs Becker and Fagen too.